Many organic farmers sow peas not by date but by average daily temperature. Though few humans track this interesting statistic, the common lilac does. It leafs out when average day and night temperatures hit a certain point. Wherever you live, you’ll give your peas a good start if you plant them when lilac leaves are about the size of your pinky fingernail. To grow healthy peas, pick a well-drained spot in the sunniest place possible. If the soil doesn’t drain well, peas may suffer from fusarium wilt, or pea root rot. To avoid this, mound the pea bed with 8-12 inches of topsoil mixed with compost. When planted in well-drained but moist, compost-enriched soil, peas will sprout quickly and produce deep, sturdy roots. To improve germination, soak dry seed peas for an hour in cool water, then roll them in a legume inoculant. This contains special bacteria (rhizobia) that help legumes (peas and beans) produce large quantities of nitrogen-fixing nodules on their roots quickly. If you look at pea or bean roots, you’ll notice little whitish lumps or storage nodules that contain atmospheric nitrogen absorbed from the air through the plants’ leaves. If you cut tops off instead of pulling plants up at season’s end, legume roots will release stored nitrogen back into the soil to nourish the next crops. Check the packet before buying an inoculant and choose one that works for all peas, including sweet peas, and for string beans, snap beans and lima beans. Though these plants will form root nodules eventually, you’ll get larger crops with an inoculant because many soils lack adequate colonies of the specific bacteria legumes need. Given the right inoculant, the young roots will function fully right away, even in cold soil. To sow peas, make a shallow furrow with your trowel and plant them about an inch deep. If your soil is well enriched with compost, you can simply push the peas into the soft soil to a depth of an inch or a little more. Some gardeners pre-sprout their peas to make sure they get off to a good start. To do this, inoculate your peas, then roll them up in a damp paper towel and tuck it into a plastic bag. Leave the top open so you don’t have mold or mildew problems. Indoors, peas can germinate in as few as 5 days, while outside it may take as long as 2 weeks. Plant sprouted peas 2-3 inches apart, placing each seed an inch below the soil surface. If crows, squirrels or deer are a problem, protect young plants with a floating row cover cloth. Cook fettuccine according to package directions. While pasta cooks, heat oil and garlic in a shallow pan over medium-high heat and cook, stirring often, until lightly golden (2-3 minutes). Add mushrooms and snow peas and cook, pan covered, for 2 minutes. Add wine or broth, bring to a simmer, add smoked tuna, cover pan and reduce heat to medium low. Simmer gently until heated (2-3 minutes). Stir in vinegar, capers and parsley, and serve at once over hot, drained fettuccine, garnished with grated cheese. Serves 4. In a heavy frying pan, combine oil, pepper flakes, sesame seeds and garlic, and cook over medium-high heat until pale golden (1-2 minutes). Add fennel, green onions, cabbage and soy sauce and cook, stirring occasionally, until barely tender (4-5 minutes). Add prawns and peas and cook, stirring occasionally, until prawns are opaque (3-4 minutes). Add wine or broth, cover pan and cook for 2 minutes. Serve hot over rice or pasta, garnished with cilantro. Serves 4. 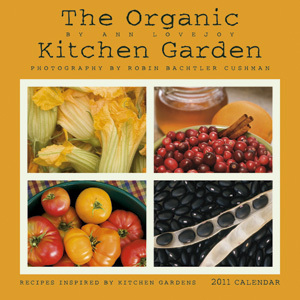 This entry was posted in Kitchen & Gardening, Recipes on May 5, 2011 by Amber Lotus Publishing.